By Allan Fox: WBA welterweight champion Keith “One Time” Thurman (26-0, 22 KOs) is doing a lot of talking during the build up to his title defense this Saturday night on June 25 against challenge Shawn Porter (26-1-1, 16 KOs) on Showtime Championship Boxing on CBS from the Barclays Center in Brooklyn, New York. Thurman making comments that don’t seem logical. He’s talking about wanting to use nonstop movement for 12 rounds to keep Porter from landing any blows in the fight, but at the same time, he’s saying he’s going to stand toe-to-toe and fight. However, in the next breath, Thurman says he’s going to go toe-to-toe while backing up and going side to side. I don’t know about you, but I don’t think it’s physically possible to go toe-to-toe while backing up or going side to side for 12 rounds unless you have big feet. “There’s been a few fights were I’ve exerted a little bit too much energy in round one,” said Thurman. “We’re going to go through these gears very wisely and do what we need to do to break Shawn Porter down and knocking him out. I believe that Shawn fades by the 5th round. He still fights then same but he slows down to a degree. His hands start to drop. That’s why the biggest thing for me going into the Shawn Porter fight is his defense. If you’re there to get hit, then you’re there to get hurt, and that’s what we believe we’re going to do to Shawn Porter,” said Thurman. 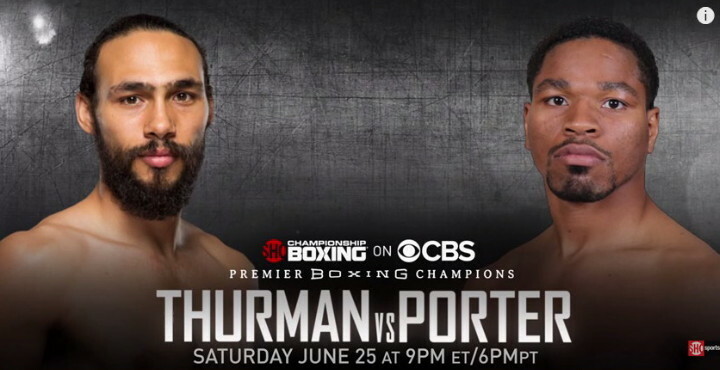 I think there would be a possibility of Thurman hurting Porter if he would stand and fight him toe-to-toe, but I don’t think Thurman is going to do that on June 25. Thurman has the punching power to hurt Porter if he lands clean with one of his big left hooks. But I don’t see Thurman being able to do that if all he’s going to do is be looking to throw pot shots and then retreating immediately. Thurman could land some left hooks while in the retreat move, but he doesn’t have a lot of power on those shots because he doesn’t set his feet. Those shots are thrown with maybe 60 percent power when Thurman is backing up because he doesn’t have his feet planted firmly on the canvas, and he’s always looking out for a counter. Thurman would do well to forget about running in this fight and focus on fighting Porter in a toe-to-toe manner, because he’s not going to win over any fans if he’s seen running from Porter for 12 rounds like we’ve seen in some of his other fights. This fight is Thurman’s big opportunity to show the boxing world that he can make a move to step into the big shoes left vacant with Floyd Mayweather Jr’s retirement. Thus far, none of the welterweights have been able to fill those shoes, least of all Thurman with his running style of fighting. Thurman needs to see the big picture that it’s not about just winning. It’s about how you win. Thurman has to win by making it an exciting fight, and the way to do that is by him staying in the pocket and resisting the urge to run. Thurman’s fighting style is just as frustrating to watch as former heavyweight champion Wladimir Klitschko in my view. Klitschko has a bad habit of holding constantly in his fights, which has kept him from becoming as popular as he could be in the U.S. Thurman’s bad habit is his running. He just won’t stay in the pocket for anything despite him usually having the power advantage over his opponents. If weaker punchers like Mayweather was willing to stand in the pocket and risk getting hit, then Thurman should be more than willing to do the same thing if he wants to become a star.